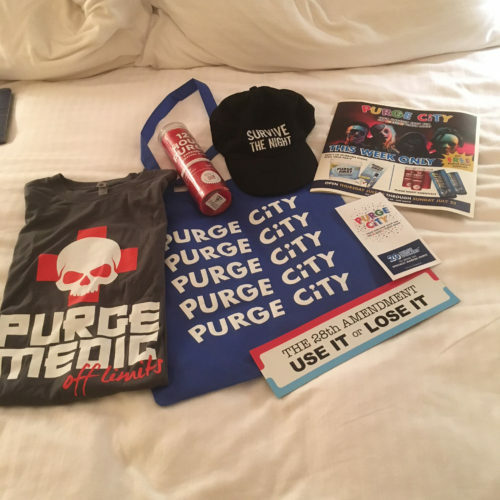 We laughed, kind of impressed by how seriously the employees of Purge City were taking their jobs at Comic-Con. 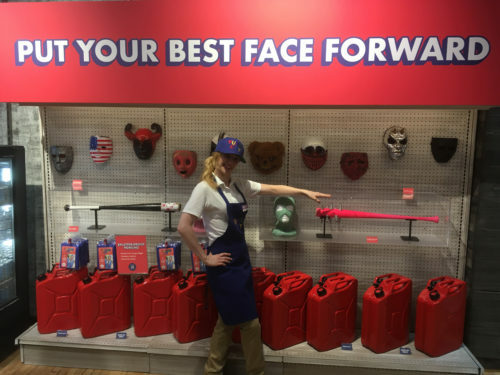 But once you step inside the pop-up store at the foot of Petco Park, and every employee asks you about your plans, and seems so knowledgeable about what you can do with the supplies they carry, your own smile becomes more forced. Or not — because the Purge, about to be a 10 episode series on USA, is about a moral choice. Some people survive it quite nicely by having no morals. 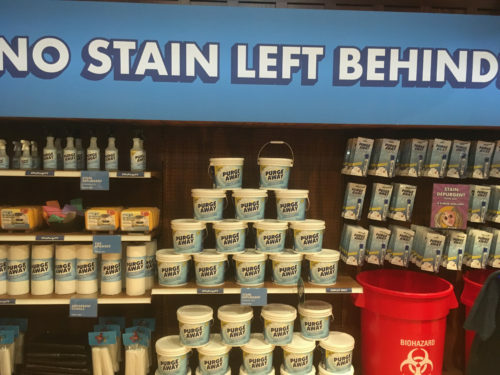 Maybe you DO need a can of “Purge Away” to make sure your pesky “organic stains” don’t stay in your clothing. 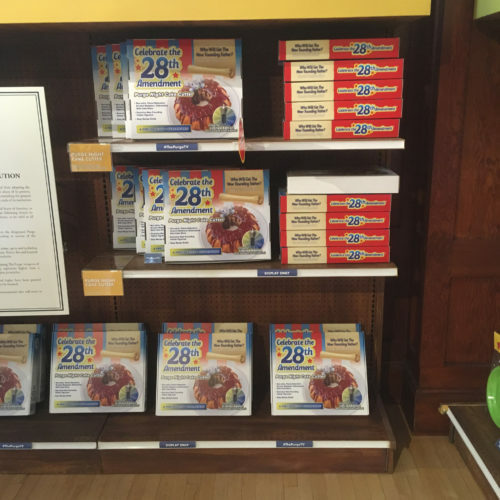 Every 20 minutes or so, there are even helpful demonstrations on how to use it, and its companion stain remover stick. Maybe your poncho will protect you from splatter, but it never hurts to be cautious. If you bought a nifty new t-shirt celebrating the 28th Amendment, you don’t want to get any blood on it during the excitement. To help you make the right purchases, you even get an envelope containing “Purge Dollars” upon entrance. They hand you $20 in an envelope, which should be enough to get a variety of memorabilia or tools before the Purge starts. The installation, opening at 11 and closing by 5 every day of Comic-Con, proves that there’s still something to immersive experiences that are simple and analog. They’ve thought it through, inspired by the film series and the upcoming television series that explores just what the citizens of this future United States do when it’s not the Purge. Apparently, they have Purge parties celebrating the 28th amendment. They play fun party games. And if the little ones are too little, a helpful employee makes sure they still get a free balloon. Though who’s bringing kids in here? Even the cashier holds character extremely well. Being constantly asked your plans and then if you’re more offensive or defensive starts to actually put customers on edge. Should we answer honestly? What are the consequences? When the clerk asked if I was a cat or a dog person, I had to hesitate, trying to get a read on what the right answer might be, and what might the consequences be? USA Network did well with this installation. It sets a tone, and effectively separates Comic-Con attendees from their normal experience on the street outside. The potentially most twisted items are mere mock-ups, but they’re too plausible. Will it get me to watch the series when it debuts? Possibly. Will it stand as one of the most memorable Comic-Con installations? Definitely. And yes, we’re prepared now. A bit jingoistic, but we will survive the night.